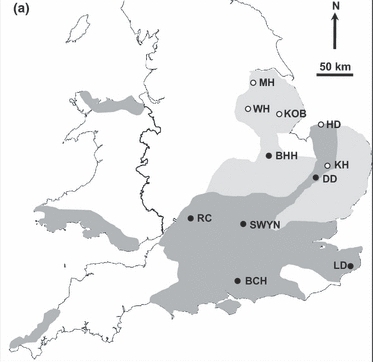 The Brown Argus occurs in southern Britain. It's a butterfly from the family of "Blues" (It resembles the female Common Blue very closely), widespread in particular habitats, feeding on several common plants such as rock- rose, crane's-bill, and stork's- bill. Researchers James Buckley, Roger Butlin and Jon Bridle published a paper in Molecular Ecology entitled, "Evidence for evolutionary change associated with the recent range expansion of the British butterfly, Aricia agestis, in response to climate change." However, the significance of the research is that Red Book extinctions can be reduced with genetic studies as outstanding as this! The implication that climate change will already have begun influencing the distribution of more vulnerable organisms is tested on a creature that has mobility, has expanded recently to new habitats, doubling its small range since 1982. The genome scan of the butterfly was carried out throughout its range in southern England and Wales. Its European range stretches as far as the Middle East, so this population is at one of the extremes. To prevent extinctions of many vulnerable species, butterflies and others will need to "track" suitable environments, despite fragmented landscapes in heavily populated areas such as England and much of industrialised Europe. Butterflies have been reported moving to higher latitudes and altitudes recently, but the rate of expansion in other species is painfully slow (or static). Obviously, habitat specialists suffer the most, indicating that land use change is increasing extinction risks. The phrase "ecological margins" therefore becomes significant here, as these are the areas where evolutionary and ecological change meet! 254 males were collected from 11 widespread and diverse sites, killed and stored at -20oC. Long established sites were regarded as those occupied in 1970-82 and recently-colonised sites were regarded as those used since 1995-99.
established sites are shown dark grey while the "new" sites are lighter. DNA was taken from the thorax of five random individuals and genetic diversity measured to build a population genetic structure for the sites, with the help of Andrew Rambaud at the University of Edinburgh. There was no evidence produced for a reduction in genetic diversity at the range margins, but evidence of two clusters at newly-colonised sites indicates independent expansions in two directions. There was likewise no evidence for strong genetic drift in the expansion, with diversity mainly evident within a site(96-1% of diversity) rather than between sites (only 3-9% of diversity)On the chromosomes, 21 loci could be identified as "under selection," using three different methodologies. That is 5.1% of all loci. One of the features of the study is local adaptation across the well-established part of the range (dark grey in the map). Range expansion here seems to significantly increase evolutionary change. Rapid change can obviously occur when some genotypes dominate in new sites. This study illustrates beautifully strong patterns of diverging gene frequencies (properly allele frequencies) in colonists. Large population sizes are currently reducing the chance of what is being called mutation surfing! Genetic drift is negligible so the natural selection of allele frequencies has been happening during the butterfly's colonisation. Northward advance and evolutionary change using pre-existing variations in habitat preference have successfully adapted one species to a novel climate. Buckley, Butlin and Bridle have pointed out to all of us the need for useful (habitat-preference) variation in every species that can adapt. We need to research widely for those species of all shapes and sizes with little variation, liable to join the queue for extinction.